This area is blessed with many things: Natural beauty. Educational and cultural opportunities. And an abundance of brilliant women. Fairfield County teems with high achievers. After starting families, they’re ready to go back to work. But rather than return to the corporate world, they’re starting their own businesses. Westporter Janis Collins — entrepreneur-in-residence for the Stamford Innovation Center and B:HIve in Bridgeport — has met with over 200 Connecticut startups in the past year. A quarter were led by women. It’s an underserved market, Collins says. They get less than 10% of all venture capital money — despite studies showing that these companies perform at par or greater than those with male CEOs. Over 25 mentors — female and male — have already signed up. The core team includes Jen Gabler, North Shutshiwaran and Bill Gordon. All 3 live in Westport or Weston. Local talent like Andy Moss, Steve Obsitnik, Galia Gichon and Jenny Lawton are ready to advise and assist too. The Westport Library, Westport Sunrise Rotary and Stamford Innovation Center provide grant money to the top performing company in the program. 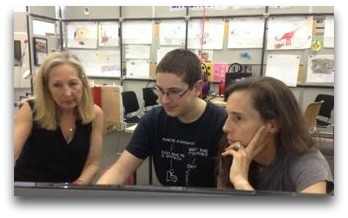 Janis Collins (left) and Jen Gabler work with Daniel Ruskin, who is helping with The Refinery’s tech side. The Library has integrated The Refinery into its Maker-in-Residence program. So — along with meeting rooms — the innovative Maker Space is available to Refinery members. The Refinery says it is different from other accelerators because it is highly individualized; it serves pre-revenue companies, as well as those that have launched or need a re-boot; it matches mentors with industry-specific experience, and its location accesses New York and Boston networks. Through June 15, the organization is accepting applications for a 12-week fall program. Applicants should have launched — or be ready to launch — a product or digital service by the end of 2014. Companies should have the potential to grow to more than $10 million in revenues within 4 to 6 years. To apply for the fall program, click on The Refinery website. The accelerator culminates in a Pitch Night. Teams will present their companies to the community, pitch to potential investors, and compete for cash awards. “This is a community effort to create local jobs, and investible companies,” Collins says. And Fairfield County’s remarkable women lead the way. This entry was posted in Economy, Local business, Organizations, People and tagged B:Hive Bridgeport, Janis Collins, Stamford Innovation Center, The Refinery, Westport Library. Bookmark the permalink.